Monaco moved up to second in Ligue 1 with a dominant victory over Ajaccio. The hosts looked under threat of being frustrated before Jean-Baptiste Pierazzi was sent off after 62 minutes for a second booking. They got their goal when Emmanuel Riviere tapped home from a yard after Valere Germain and Andrea Raggi both failed to put the ball in from a similar distance seconds earlier. James Rodriguez hit the post with two late free-kicks. Monaco took advantage of Lille's earlier slip to overtake them into second and move to within two points of leaders Paris St-Germain. Landry N'Guemo had scored the only goal as Bordeaux won 1-0. It was the first time Lille keeper Vincent Enyeama had conceded in 1,062 minutes, under two matches away from Bordeaux custodian Gaetan Huard's record of 1,176 minutes in 1992-93. 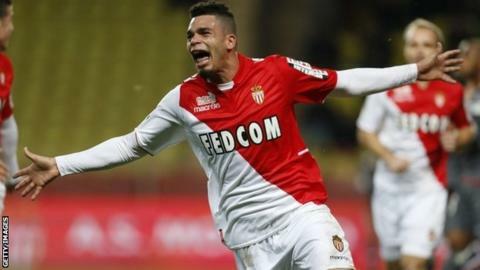 Monaco, who were without injured top scorer Radamel Falcao, were on top for the entire 90 minutes but failed to take a host of chances before Pierazzi's two bookings, both for fouls on Rodriguez. Riviere scored the goal after it looked like another squandered chance by two of his team-mates and had Rodriguez gone an inch closer with both of his free-kicks, the visitors could have had no complaints. Match ends, Monaco 1, Ajaccio 0. Second Half ends, Monaco 1, Ajaccio 0. Attempt saved. Mehdi Mostefa (Ajaccio) right footed shot from outside the box is saved in the bottom left corner. Hand ball by Ricardo Faty (Ajaccio). Corner, Ajaccio. Conceded by Layvin Kurzawa. Offside, Ajaccio. Benjamin André tries a through ball, but Eduardo is caught offside. Eduardo (Ajaccio) wins a free kick in the defensive half. Attempt saved. Valere Germain (Monaco) header from the centre of the box is saved in the bottom left corner. Assisted by Ricardo Carvalho with a cross. João Moutinho (Monaco) hits the right post with a right footed shot from outside the box from a direct free kick. Eric Abidal (Monaco) wins a free kick in the attacking half. Valere Germain (Monaco) is shown the yellow card for a bad foul. Foul by Valere Germain (Monaco). Lucas Ocampos (Monaco) hits the right post with a left footed shot from outside the box from a direct free kick. Lucas Ocampos (Monaco) wins a free kick in the attacking half. Foul by Mehdi Mostefa (Ajaccio). Attempt blocked. Jérémy Toulalan (Monaco) right footed shot from outside the box is blocked. Assisted by João Moutinho. James Rodríguez (Monaco) wins a free kick on the right wing. Foul by Ricardo Faty (Ajaccio). Goal! Monaco 1, Ajaccio 0. Emmanuel Rivière (Monaco) left footed shot from very close range to the bottom left corner. Assisted by Andrea Raggi. Attempt missed. Andrea Raggi (Monaco) right footed shot from the right side of the six yard box misses to the left. Assisted by Valere Germain. Offside, Monaco. Valere Germain tries a through ball, but Emmanuel Rivière is caught offside. Valere Germain (Monaco) wins a free kick on the right wing. Substitution, Monaco. Valere Germain replaces Mounir Obbadi. Offside, Monaco. James Rodríguez tries a through ball, but Lucas Ocampos is caught offside. Offside, Monaco. Lucas Ocampos tries a through ball, but Mounir Obbadi is caught offside. Laurent Bonnart (Ajaccio) wins a free kick in the defensive half. Attempt missed. Andrea Raggi (Monaco) header from the centre of the box misses to the right. Assisted by James Rodríguez with a cross following a corner. Corner, Monaco. Conceded by Benjamin André. Corner, Monaco. Conceded by Paul Lasne.